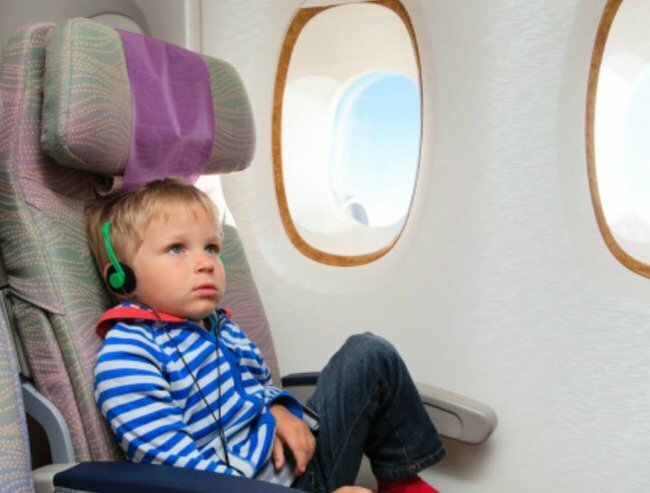 How do you feel about kids flying with iPads? It was the first aeroplane the kids had ever been on. Leading up to the departure they had been so excited and also very nervous, and they couldn’t wait to be on a real jet. But here they were, half an hour into the flight, asking for iPads. Had the novelty really worn off that quickly? Was the prospect of having a screen truly more exciting than being 11km off the ground? It was the first flight Jean&apos;s kids had been on. Image via iStock. According to our in-flight entertainment menu, iPads could be hired for the duration of the trip. “They cost ten dollars!” I said, hoping the absurd price might put the kids off. But before we left, their grandmother had kindly given them $50 each, so they were feeling extraordinarily rich. “I don’t care!” my son said. “I want to get one!” I’m pretty sure this is exactly the response the airline company bosses hoped for. Although I knew I shouldn’t dictate what the children could and couldn’t buy, it seemed such a shame to spend so much before we’d even reached our destination. “Okay,” I said, putting on my serious negotiation voice. “How about this: if you both have ten dollars left at the end of the holiday, you can get iPads on the flight home.” Amazingly, they both agreed. Then they spent the rest of the trip analysing the safety instructions, wriggling, moving the tray tables up and down and saying, “Are we there yet?” repeatedly. The snacks I’d packed lasted all of about seven minutes. We might have been flying, but time was certainly not. We don’t own a tablet. We don’t have any video game consoles either. The kids have access to one screen – a television. On top of this, they’re only allowed to watch it on Fridays (after school) and weekends (any time). This system works pretty well; the kids accept the restriction and are adept at making their own fun. Before and after school they spend a lot of time messing around with cardboard and sticky tape, or playing detectives, or inventing dances. Jean&apos;s family don&apos;t own a tablet. Image via iStock. Of course, travelling is different to being at home. It’s difficult to choreograph hip-hop moves while strapped into a car seat. Nevertheless, we don’t have a portable DVD player in the car and the kids aren’t allowed to fool around with our phones. When we go for long drives they have to, as I like to say, suffer in their undies. Just like I did when I was a kid. After a week of Queensland sunshine it was time to return home. We got to the airport early, checked in then joined the other passengers waiting at Gate 5. There was a toddler sitting nearby, playing with her mother’s phone. She would have been about eighteen months – nappy on, dummy in – but boy was she swiping that tiny screen like a pro. And although I was impressed at the tech-savvies of the infant, I felt sad for her too. What happened to learning patience? Can’t today’s children cope without constant entertainment? The Flynn family holiday. Image: Supplied. As soon as we boarded the aeroplane the topic of iPads came up. Both of the kids had successfully saved part of their holiday pocket money, and they knew exactly what they wanted to spend it on. “When will I get one?” my son asked, doing his seatbelt up. “Not until after we’ve taken off,” I explained. “You’ll have to wait for the announcement.” Fifteen minutes later the technology-laden trolley finally appeared. I handed over twenty dollars and the kids almost exploded with anticipation. They then spent the rest of the journey staring at their screens, oblivious to the world around them. At first I felt disappointed. I wished that they were more interested in flying than watching Home Alone. But then something occurred to me: I didn’t have to listen to a detailed explanation of the plot of an animated television show I’d never seen. I didn’t have to tell anyone to sit still and stop complaining. I didn’t have to play Animal, Vegetable, Mineral or I Spy. My children were completely engaged, and I was free to have a break from parenting. And so, with no-one to bother me, I did something ever so slightly hypocritical: I got my laptop out. My very own screen. And as it booted up I thought, patience shmatience. The tops of clouds aren’t actually that interesting. How do you monitor your kids&apos; technology usage?